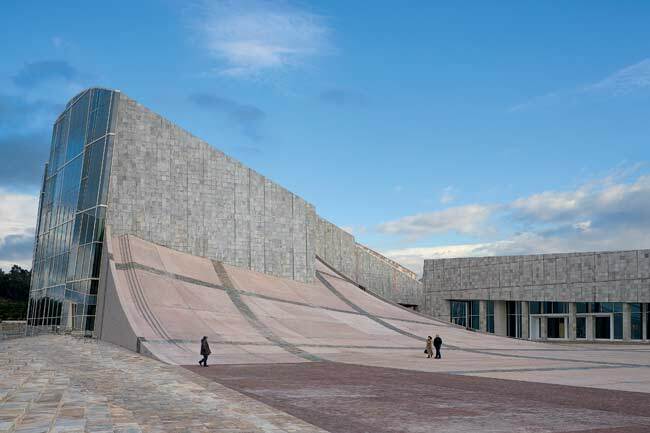 I love Architectural design theory and I love skate boarding; Peter Eisenman combined them both when he designed the 173-acre site on Mount Gaiás. The project neighbors Santiago de Compostela where the cathedral houses the remains of the apostle St. James, brought to Spain from Jerusalem after his death in AD 44. Since the eighth century, pilgrims have trekked to the medieval town to pay homage to his shrine. Eisenman Architects’ winning scheme, folded into the earth and seductively represented by a molded wood model, beat out varied proposals by ten finalists: Steven Holl Architects, OMA/Rem Koolhaas, Ateliers Jean Nouvel, Gigon Guyer Architects, Dominique Perrault Architecture, Studio Daniel Libeskind, Juan Navarro Baldeweg, César Portela, Ricardo Bofill/Taller de Arquitectura, and José Manuel Gallego Jorreto.